The brain is just like any other muscle in the body, and the only way to keep it healthy is to constantly challenge it. Even seniors who have been diagnosed with Alzheimer’s can benefit from brain-boosting activities that strengthen the synapses and sharpen the mind. Here are five pastimes and hobbies that may minimize the symptoms of Alzheimer’s and boost your aging loved one’s cognitive health. Specialists from around the world use music therapy to treat a wide array of mental health complications. 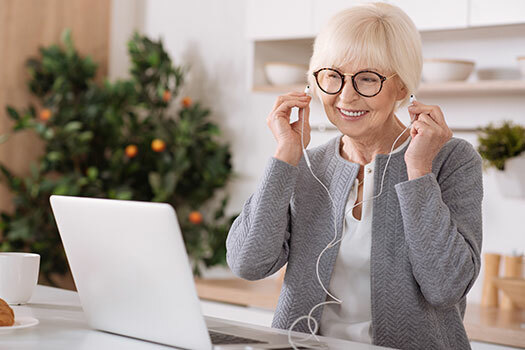 For seniors who have Alzheimer’s, singing along to music can stir up memories and stimulate the production of important chemicals like serotonin. Singing also challenges multiple areas of the brain at the same time, which makes it a great pastime for those who want to delay cognitive decline. If your loved one can no longer remember the words, ask him or her to hum along to the tune or simply tap his or her feet. Studies suggest older adults with Alzheimer’s receive many cognitive benefits when engaging in music therapy. If you have a senior loved one who needs help maintaining a high quality of life while aging in place, reach out to Home Care Assistance, a leading provider of home care Clarksville families can rely on. All of our caregivers are bonded, licensed, and insured, there are no hidden fees, and we never ask our clients to sign long-term contracts. Very few activities are as stimulating as attempting to complete a larger puzzle. While going through the pieces, your loved one will need to focus on different sizes, shapes, and colors and use his or her hands and fingers to manipulate the pieces. Another benefit of working on puzzles is the sense of accomplishment that is felt once the picture has been put together. Seniors who want to further celebrate their accomplishments can glue or even frame their favorite puzzles. Following instructions is a skill many take for granted, but some seniors lose this ability as they grow older. Baking can be done at any age, and you can find recipes for every skill level imaginable. As your loved one’s disorder progresses, help him or her work on easier recipes or do some of the prep work for him or her. You will also know exactly what is going into your loved one’s food if you help with baking. If you are unable to find time to assist your elderly loved one with preparing meals, consider hiring a professional caregiver. Clarksville home care experts are available to provide high-quality care to seniors on an as-needed basis. From assistance with mobility and exercise to providing transportation to the doctor’s office and social events, there are a variety of ways professional caregivers can help your aging loved one continue to live independently. Studies continue to show that gardening can relieve stress, burn calories, enhance self-esteem, and boost brain health. If your loved one doesn’t have a yard to work in, try making a smaller garden in front of a window or out on a balcony. Once the initial seeds have been planted, you and your loved one can make a large calendar with daily gardening tips and instructions. There may come a point when your loved one can no longer engage in complex activities, but this doesn’t mean you can’t stimulate his or her mind. Organizing household items by size, color, or use is a great activity for seniors who have Alzheimer’s. Your loved one might enjoy this pastime if he or she used to take pleasure in other organizational tasks. Engaging in brain boosting activities helps seniors with Alzheimer’s delay the symptoms of the disease. If you are the primary caregiver for a senior family member and you need respite care, Clarksville, TN, Home Care Assistance is here to help. Our respite caregivers are trained to assist older adults with a wide variety of everyday tasks, including meal prep, physical activity, and personal hygiene. We also provide 24-hour care and specialized care for seniors with Alzheimer’s, dementia, and Parkinson’s. To schedule an in-home consultation, call us at (931) 444-1950 today.